Hisar (Haryana), As their talks with the district administration in Haryana's Hisar failed to reach a settlement, leaders of the Jat community called for stepping up their agitation from Tuesday even as the government warned they would be dealt with sternly. Jat leader Yashpal Malik said the community will block railway tracks and roads from Tuesday after talks with the authorities failed to clinch a breakthrough here Monday evening. Hisar Deputy Commissioner Amit Kumar Aggarwal asked the community not to resume the agitation, and said that the paramilitary Rapid Action Force has been requisitioned in the district to deal with any situation. Having failed to secure reservation for their community from the state and central governments, protesors from the Jat community blocked rail tracks in Hisar district Monday morning. Police said the tracks were blocked near Mayyar village in Hisar, 280 km from Chandigarh, disrupting rail services through the area. The agitating Jats Sunday served a 24-hour ultimatum to the central and state governments to make an announcement regarding reservation for the Jat community in government jobs. The ultimatum ended at 5 p.m. Monday. The community members had led a three-week-long agitation in the Jat-dominated districts of Hisar, Jind and Bhiwani in Haryana in March last year, seeking reservation in government jobs under the Other Backward Classes (OBC) quota. They had later withdrawn the agitation after the Bhupinder Singh Hooda government assured it would take up their case with the central government. 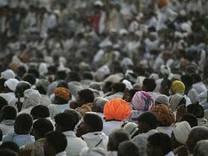 The Hooda government later set up the Haryana Backward Classes Commission to look into the reservation aspect. The commission is considering the demands of the Roar, Jat, Jat Sikh, Tyagi, Bishnoi and other communities who wish to be classified as backward classes in the state. Last year, the protestors, including women, children and the elderly, had blocked rail tracks at 15 points across Haryana. The worst affected were Hisar, Bhiwani and Jind districts.